Being the last to arrive in a big family of twelve had a profound effect on me. The life of my childhood home in Kuala Lumpur centred around food. My mum was an excellent cook. She was originally from Chang Mai but was brought up mainly in Malaysia and was combining ingredients to cook "fusion" for her family long before the term was ever coined anywhere else. For my part being the youngest I would taken by the hand to the wet market to buy fish and I would watch her as she carefully selected the best produce. Her skills still go through my head as I go through my check list for buying fish at our local fishmongers. 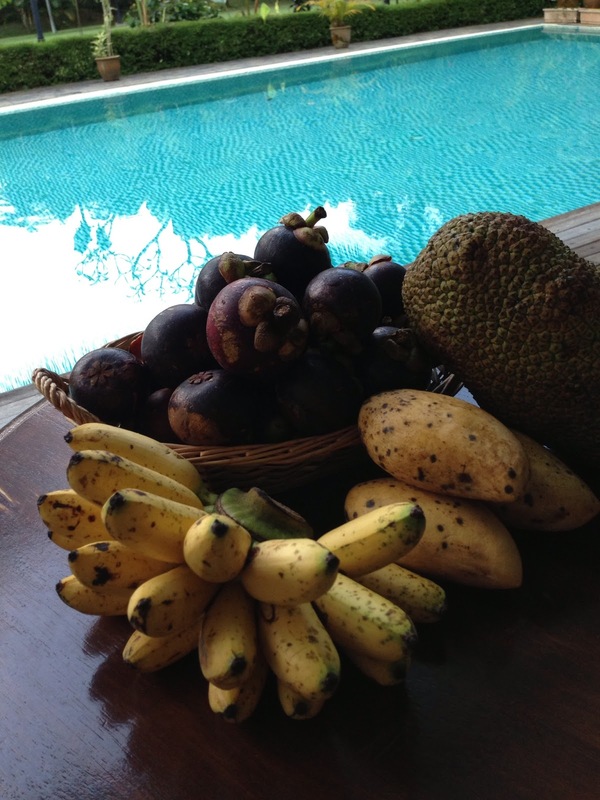 Breakfast fruits on a recent visit to my sister's, served by the pool! Our city garden was full of fruit trees and being the smallest I was made to climb up on my big brothers' shoulders to try to retrieve the best fruits. There balanced precariously I would reach for the juiciest rambutans, papayas and mangos which were always just inches out of reach. Best of all though were the school holiday trips to my grandparents farm about three hours from KL where my father's family lived . The 'dusun' or orchard was to me the garden of Eden with neat rows of laden mangosteen trees, rambutans and mango trees which I would climb to get the best fruit. Also of course the infamous durian the king of fruits which you either love or hate. They bear huge prehistoric looking fruits with lethal spikes and have a pungent smell. They are so large they can only be harvested after they've fallen to the ground which happens only at night. They are much beloved by tigers many of which meet an untimely end as they fall asleep under the trees and when the fruits fall they are killed! There was so much produce from the garden that my aunt used to show me how to tie it up into neat bunches like grapes which we could then sell by the roadside. I'd come home happy having earned a little much appreciated pocket money.